MONITORING SYSTEMS INSTALLATION According to current regulations, all tanks will require approved monitoring programs. GHH evaluates monitoring methods, installs the required systems, and provides sampling with analytical and reporting services. GHH maintains a current Health and Safety Program in accordance with Federal OSHA requirements, 29CFR 1919.120(e) and recent California laws regarding hazardous licensing. All supervising and field personnel receive the annual training and examinations required to work in a potentially hazardous environment. 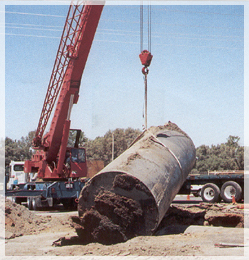 TANK REMOVAL AND INSTALLATION GHH is experienced in underground tank removal. Our services include permitting, utility clearances, construction management, tank disposal, soil sampling and analysis. 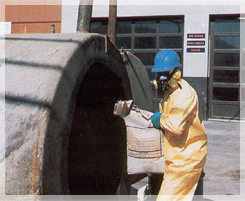 Tanks are excavated in compliance with all applicable environmental regulations and fire codes. We also provide complete turnkey services for installation of new double-walled tanks to comply with the most recent requirements. SITE INVESTIGATION If contamination is encountered during a tank in removal, GHH conducts soil and groundwater investigations as required. A competent and proficient staff provides additional sampling for completing site investigations. The interpretation and management of the lab data is recorded in a report for the client. The report also contains an evaluation of the site and our recommendations for any necessary contaminant recovery and treatment.